Sarah is passionate about her clients and delivering the utmost level of service. What sets her apart? Her refreshing, youthful energy and positive attitude – shared with every association she makes. With almost a decade of real estate experience working alongside Phil Harris, she benefits from exposure to the highest level of training and industry professionalism that Harris Real Estate commands. 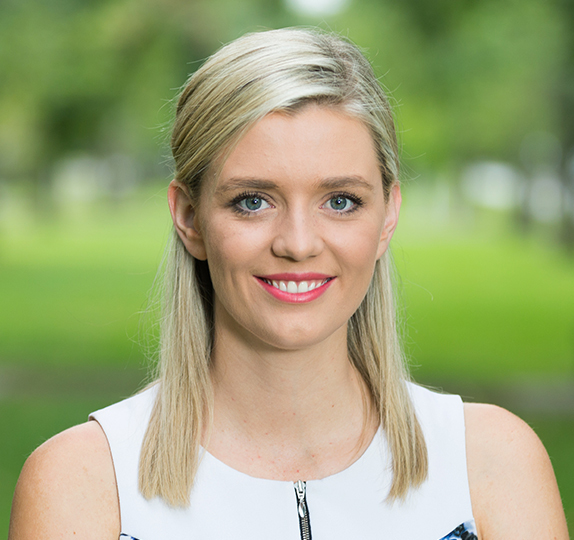 Sarah’s obsession for learning and self-development makes her one of South Australia’s rising stars of the industry offering her unique, client-focused style. Sarah is an incredibly hard worker and prides herself on her honest, factual advice. As a vendor or purchaser, Sarah ensures your real estate experience is an enjoyable one; the way it should be. Growing up in the Adelaide Hills, Sarah knows South Australia intimately. Her favourite part is her shack on the River Murray, where you will find Sarah with her partner Luke paddleboarding or wakeboarding with their family and friends. Thank you Harris Real Estate! You listened to our needs and never doubted yourselves and achieved what was required to enable us to move forward To the next phase. Sarah did everything expected of her, she met possible buyers at varying times of day and night. She gave us good advice about how to present the property and always kept us informed how things were going. I would gladly refer Sarah and indeed Harris Real Estate to anyone requiring the services of an Agent. She came across as a very positive person and handled pressure situations well. Also the photographer did a wonderful job of displaying the property as best as possible. The sale process through Harris was seamless, professional, transparent and caring. I felt that our agent team worked hard for the outcome and also engaged professionally with buyers to ensure the environment enabled the best outcome to eventuate for all. We will use Harris for our future real estate needs without hesitation and refer them to our friends and family too. We’ve sold 7 investment properties with Phil Harris and agent Sarah Stewart in 6 months. We could not have been more satisfied with the outcome and the speed of sales. 6 out of 7 were under contract after the first 2 Opens. A great result when we saw similar properties languishing on the market for months. Thanks Sarah and Phil, we’ll certainly be in touch soon. We sold after 2 Opens, service great, friendly, efficient, good feedback and follow up. This is the second time I have used their professional services. It was better than the first. I am sure there will be a third. I was particularly impressed with your sales consultant, Sarah. She was professional at all times and was very obliging when I wanted to go back to the house outside of scheduled open inspection times. After purchasing the property Sarah was happy to meet us at the property for the purpose of measuring for new window treatments. Thank you Sarah and to the backup team for assisting in making this transition as easy as possible – I will be passing on my Harris R/E experience to my friends and contacts. Dearest Sarah, Thank you kindly for your most excellent and first class service. Always attentive, courteous, always well presented with a smile and warmth. You instilled in us a very deep gratitude. You worked very hard for us, thank you. We’re thrilled to have sold the house, met you and be embarking on a new adventure. You are a credit to Harris. All the best and we look forward to our paths crossing again soon in Melbourne. Sarah was very helpful throughout, before and after purchase of the house. Sarah was exceptionally efficient, accessible and supportive as I am relocating from Singapore and was only over in Adelaide for the weekend. No question was too difficult and she made sure she had an answer in a short period of time. I am very grateful for her services and would highly recommend her for the way she managed this purchase. We would highly recommend Phil Harris or Sarah Stewart to handle the sale of your property as they were both friendly and highly professional and any feedback that was required was handled very speedily. Exceptional; Sarah and all concerned were very professional, friendly, patient and nothing was too much trouble. Really made every effort to put themselves out for us. Very impressed in every way. I wouldnt consider selling a property with anyone but Harris. The service was simply outstanding.Nothing was too much trouble. They treated us like members of the family. They managed to strike the perfect balance between being personalbe and professional. We had complete trust in them and our trust was well and truly rewarded. We were thrilled with the outcome. Thanks so much Phil and Sarah and the team. Sarah was extremely helpful and approachable through out the whole process- thank you. Todd & Sarah did a fantastic job getting my house sold after the first open. They kept me well updated on buyer feedback and where they were at with the negotiations. Thank you for your efforts, much appreciated. I can’t recommend Sarah Steward highly enough. She is warm, honest, reliable and very very personable. We trusted her to sell our property and she did not let us down. We are very happy with the result.